WASHINGTON DC – President Donald J. Trump has declared Wednesday, Dec. 5 as a federal holiday. This means all federal buildings will be closed, including post offices. The City of Framingham offices should remain open, unless Mayor Yvonne Spicer decides to close them. SOURCE asked the City in multiple emails if they planned to close or do anything different on Wednesday. The City finally posted on its website on Tuesday afternoon they would hold moments of silence, but would be open on Wednesday. Framingham Superintendent of Schools said there will be school on Friday. He said there was nothing in the union contracts to require him to close for the federal holiday. There is an early release for Framingham schools on Thursday. President Trump declared the holiday, to honor former President George Herbert Walker Bush. It will be a national day of mourning. 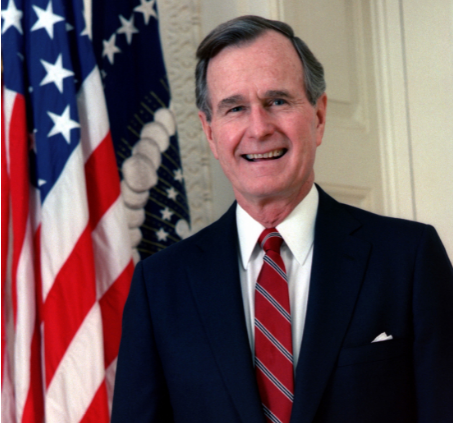 Bush, the 41st President of the United States, died on November 30. He was 94. A war hero, he is also the former ambassador to the United Nations, and the former Director of the CIA. He was born in Massachusetts and attended Phillips Academy in Andover. On the day he turned 18, he volunteered for combat duty during World War II. At the time he was the youngest aviator in naval history. Flags have been ordered to fly at half-staff on all federal, state, and city owned buildings for 30 days. Holidays were also declared when former Presidents Gerald Ford and Ronald Reagan died. Congressional leaders said President Bush would lie in state in the Capitol Rotunda from Monday, December 3 to Wednesday, December 5. A state funeral will be held Washington National Cathedral, and the White House said the President and first lady will attend. Another funeral will be held in Texas on Thursday. Editor’s note: Photo is of President George Bush. It is his official photo from the white house in 1989. Courtesy of the government.